Third installment of the 28d Project. I missed last year for reasons, but this year it's back. I'm running it slightly differently to previous versions, as this time there will be no option to buy each days package - that was frustratingly difficult to manage - sorry. Instead there will be a very simple "buy now" price for everything, and that will go up in price as February goes by, therefore those who can buy earlier...pay less...and those who buy later...pay more. Hit the [Follow] button in the right hand corner of this page as I shall be updating this post as the days go by. Should anyone wish to pre-buy...thank you for your consideration and support. Don't know what the 28d Project is? I make code available during February (each year, usually). This is code that I have created or updated and make available for an all-in price. This is a Content Module that sits on shopping_cart.php which displays a better stock message. 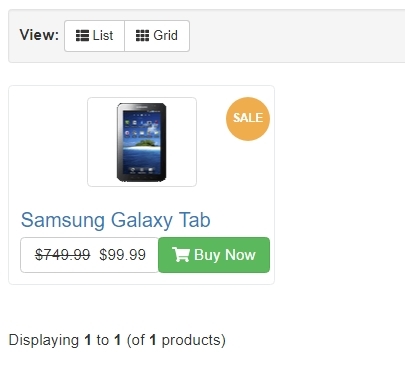 This is a Content Module and a couple of Child Modules that allows Shopowner to have "tabs" on the product_info.php page. It's a bit like how the Navbar works (main module and child modules). As these are all modules, there are no code changes, just upload and turn on. 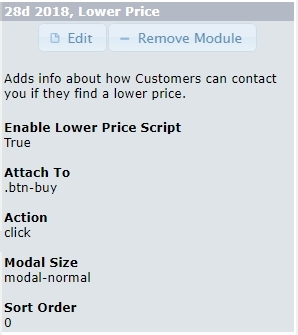 Tabs (child modules) can be ordered using the usual Sort Order system. I wanted to get this out sooner rather than later, as I thought you guys might have ideas for other tabs. I could maybe then code some up for another day in the 28d Project. Hope that makes sense ? 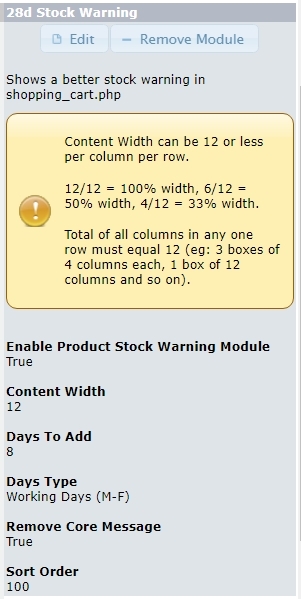 This is a Content Module for the product_info page. 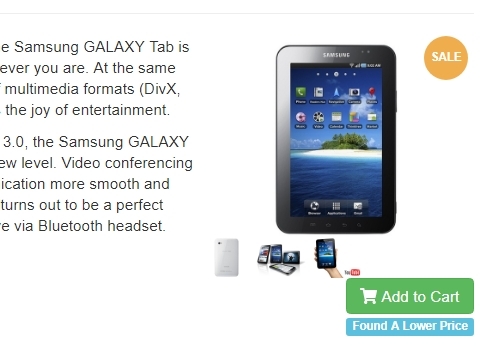 It shows the overall ratings of any reviews that the product has. 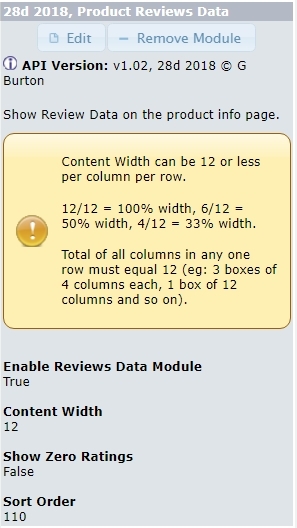 It looks good when placed near the Core p_i Reviews Module. NONE! Upload module and turn it on! Note the star rating in the right hand side. 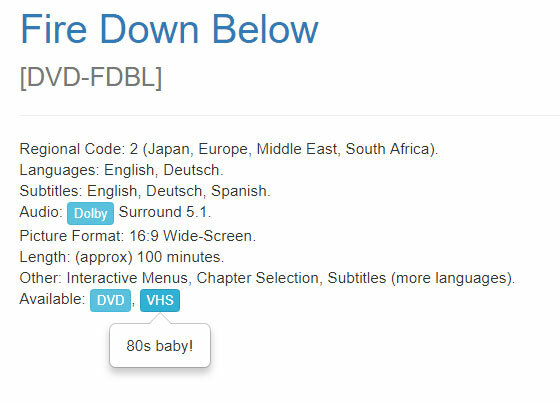 You can choose to show Zero Ratings as well if you wish. 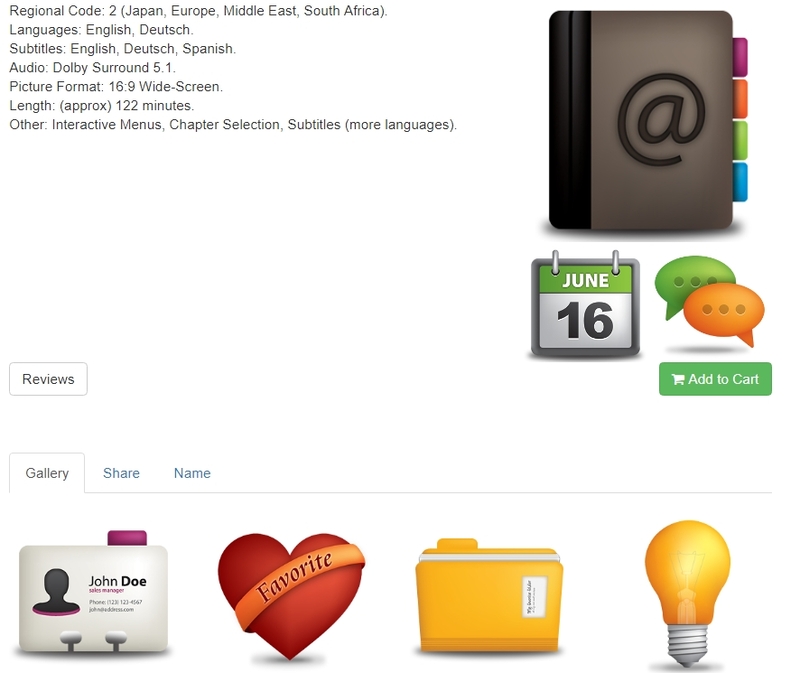 This is a Content Module for the index page which allows you to choose which Blog/News entries to showcase. NONE! Just upload, turn on, and configure. Notice that there are 4 live entries, yet Small Screen is set to to show just 1. System automatically changes to a carousel. You do require my News/Blog system that I released a couple of years ago. If you don't have it (or have lost it)...not a major problem - just let me know and I'll get it to you! 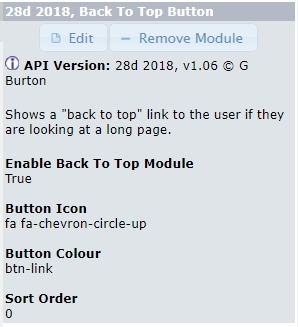 This is a Header Tag module which adds in a "back to top" button if the page is long. 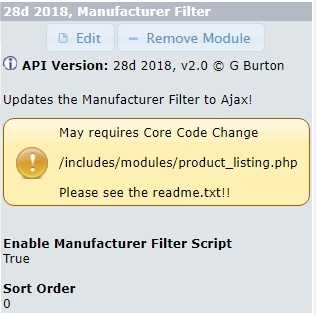 This consists of a product_info.php Content Module. And a new Admin Page. The basis of the idea is to allow you to attach "terms" to products. These terms are more than just a few words (aka folksonomy), but could be a whole paragraph or more. 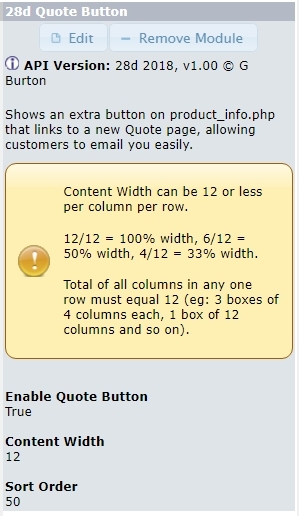 This is a product_info Content Module that adds in a button which leads to a per-product contact us form. This could be used for quoting a customer, or for general enquiries about a particular product. 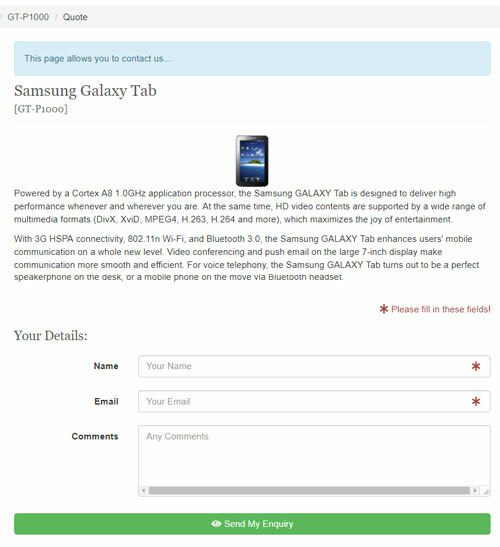 On the contact form, the user is asked for name, email and comments. These are emailed to the Store Owner. If there is enough demand, this can be made into something more - each shopowner might have different ideas...hopefully. 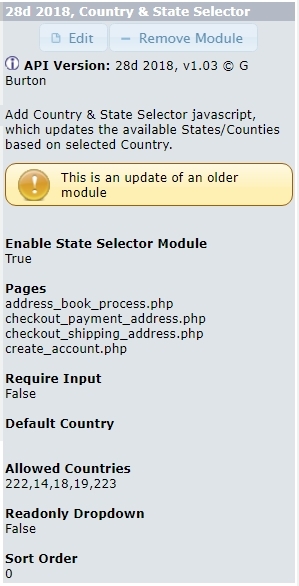 This is a HT module that changes the function of the country dropdown and the state dropdown/input box. The Country is always a dropdown, and the State can sometimes be a Dropdown, or sometimes be an Input Box - bear this in mind when reading the rest of this post! We start with this image so that I can explain some of the options. Can be True of False. If "True", the State INPUT BOX must be filled in. If "False", the Placeholder changes to "Not Required" and the input does not need to be filled in. Set this to the Country Numeric ID you wish the country dropdown to default to. If a default country is inserted *and* that default country has zones attached (eg Austria, USA etc)...the State dropdown will also be perfect on page load. Insert a CSV of Country Numeric IDs. Any country not in this list will not show in the country dropdown. If you sell to only one country, set this to True. This would also require "Default Country" to be set. This image shows how the system looks in action, on page load. The State/Province is greyed out asking the customer to first select their country. The customer now selects their country. The only countries that show are those set up in "Allowed Countries". The customer choose (eg) USA. 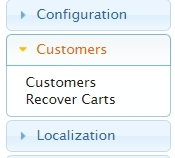 The State dropdown now activates and allows the Customer to select their State. The Customer is in the UK and misclicked! They hit themselves in the balls and click the "United Kingdom" in the Country dropdown. As the UK has no Zones attached *AND* "Require Input" is False...the State system re-activates and changes to a normal Input Box! This system allows you to remove countries from your lists without having to literally remove them in admin. This system makes things a lot easier for the customer if the country they select has zones that need to be selected. 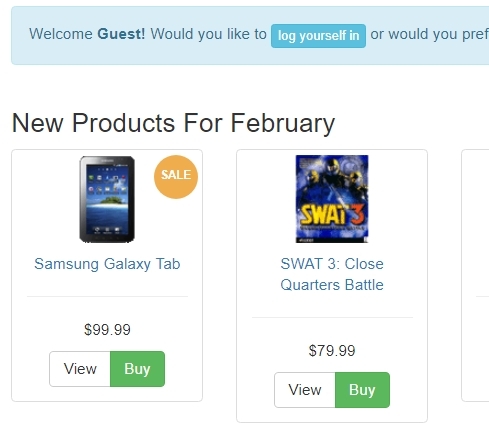 Now you can see where and what your visitors are clicking on. Is a particular place on your page a good place for clicks? Does a banner ad work really well, and so on. 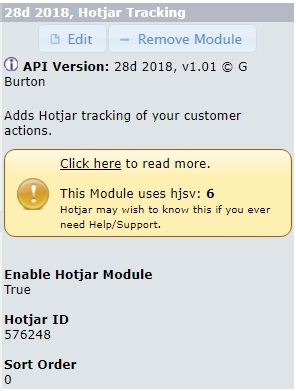 This is via Hotjar, which is a 3rd party co who offer the service. This is in use by a few of my clients, who tell me it is transforming their own ideas about their site. This is a HT module, so is a simple upload, turn on, insert your tracking id. Nothing. There is no shop side functionality. 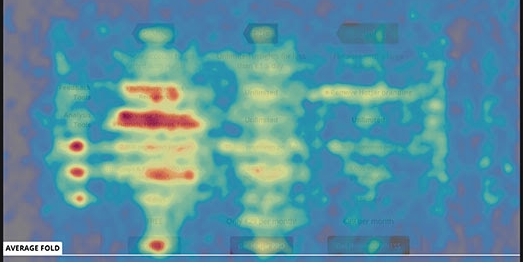 You can now set up a few different tools, the most interesting of which is the Heatmap. been extremely positive, and it has lead to me having to re-arrange a couple of customers sites to better "fit" the clicking activity. Today is Navbar Day. Here we have three NB Modules ready for you to upload, turn on and forget. 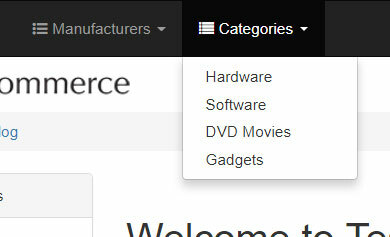 Show the First Level of Categories only, in defined Sort Order. Show a Search Link, a bit boring! All three take no core code changes. Just upload and turn on. 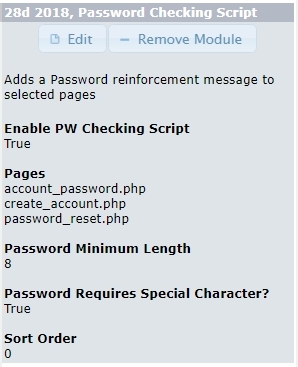 This HT module allows you to insert a message on pages that have a password input, which reminds the Customer that their password should be unbreakable. As the Customer is typing their password, the red bullet points change to green, signifying they have that "thing" in their password. This system is a reinforcement message only. It still allows Customers to insert their own password if they wish. 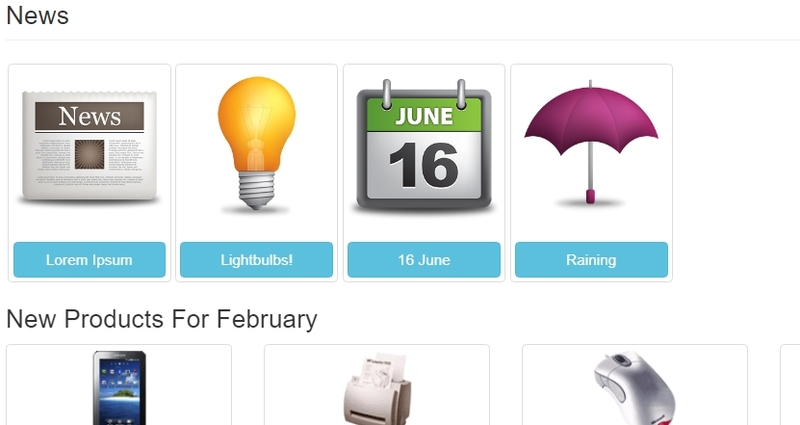 Set of Admin Pages, along with a new Admin infobox to allow you to quickly change prices for 1 or more products. 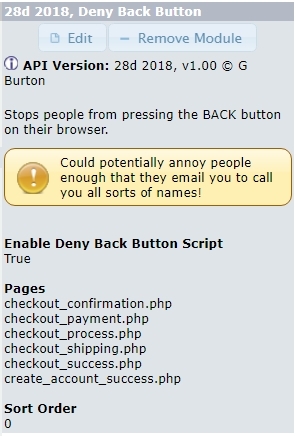 Saves you having to go into the individual product page to do this. This is an update of an older thing I made, this one now allows to update Special Prices as well as Normal Prices. 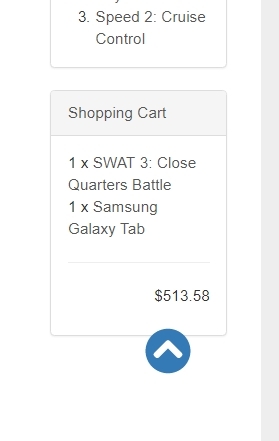 osCommerce has this built in! But it's ugly and boring. This HT module solves the ugliness and the boredom. YES - unless you are on an up-to-date Edge, in which case, NO. 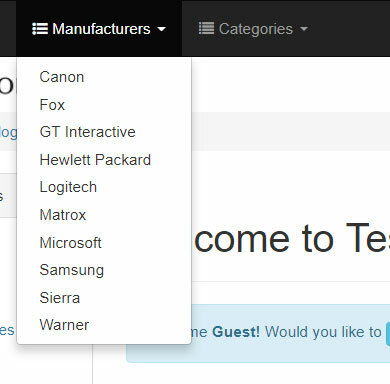 This dropdown reloads the page showing only the selected Manufacturers. The dropdown now looks nicer! 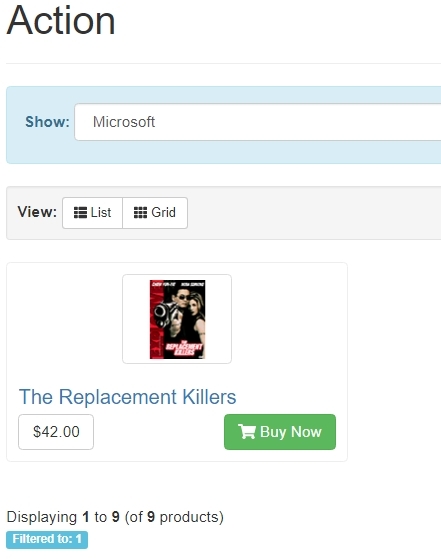 Little bit of code finesse to better present your shop to your customers. Today I have two small HT Modules which don't really do much of anything other than make your site a bit more functional. We optimised the crap out of the create_account page in order to remove the old .js system of checking on inputs to replace it with the all-new html5 way of checking on inputs. Super! Except we never did anything about ensuring the Password and Confirmation matches. So, what happens, in standard Community Version, if someone gives a password, then gives a different confirmation: the page reloads with an error message. By adding this HT module you stop that totally. 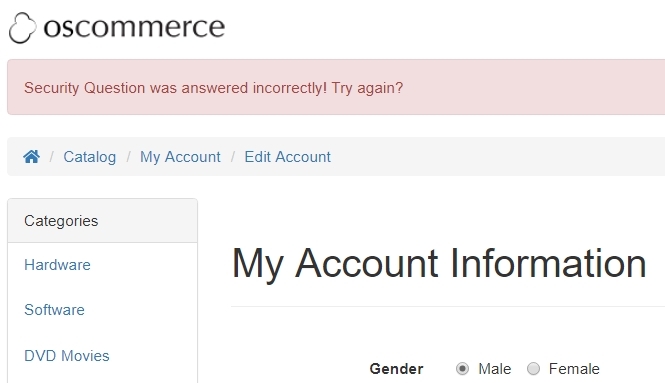 You can change the error message to whatever you want, no problem. You get up in the morning and check on your admin to find you have a few new orders, or maybe more than a few! Now you have to cycle through each order, updating order status, updating the customer by appending comment, printing an invoice, printing a label... that's potentially 10 clicks per order. If you got 20 orders that's maybe 30 minutes wasted! 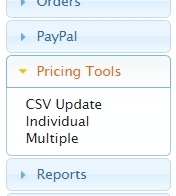 Click the "print invoices" button. This opens up a new page which has all the (ticked) invoices on it ready for printing. Each invoice starts printing on a new sheet of A4 paper. 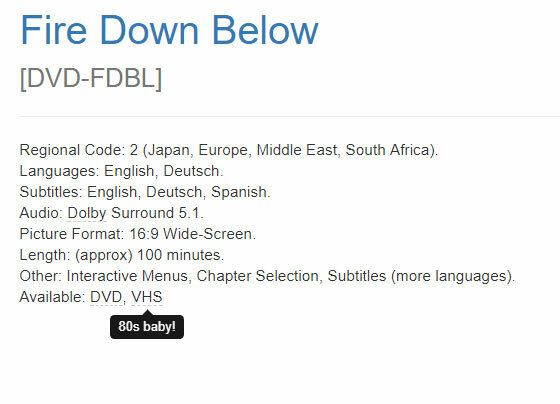 Click the "print labels" button. This opens up a new page which has all the (ticked) packing slips on it ready for printing. Each label starts printing on a new sheet of A4 paper. 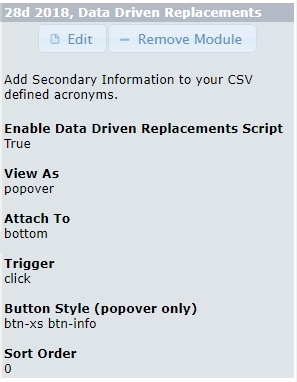 Dropdown a new Order Status, and (optionally) insert your Comment into the other box. The order gets updated to the new order *and* email is sent! 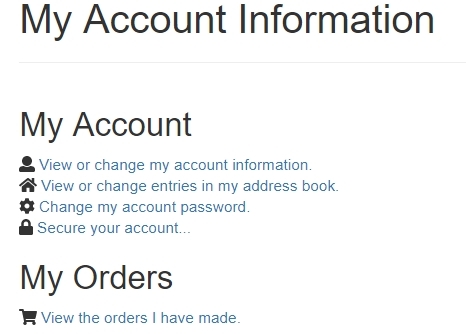 The order gets updated to the new order (and no email is sent to the Customer)! Does not matter where you, shopowner, are based in the World. It's all about your client, and if any of your clients are EU Citizens...you *must* offer them a way to see what personal details you hold about them, and offer them a way to delete out some of that data. Again...for 100% clarity...it does not matter if you are in Paris France, Paris Texas or China or Thailand or where-ever, if you sell into the EU...you must comply with EU Regulations. Just a block of text explaining what GDPR is etc. You can obviously change this to better suit your needs. All of the above are MODULES, so can be turned on/off from Admin. A way for EU clients to view the Data you hold. This may very well be enough for their needs, thereby no need to request personal intervention from you, taking up your time. If you have guest accounts, you are stuffed. I can think of at least a few more modules that can potentially be coded. But let's see what you guys have to say after you have this system. NONE - if on up-to-date Edge, otherwise Yes. Notice that you can easily change the Sticker Colour. The Sticker Text "sale!" 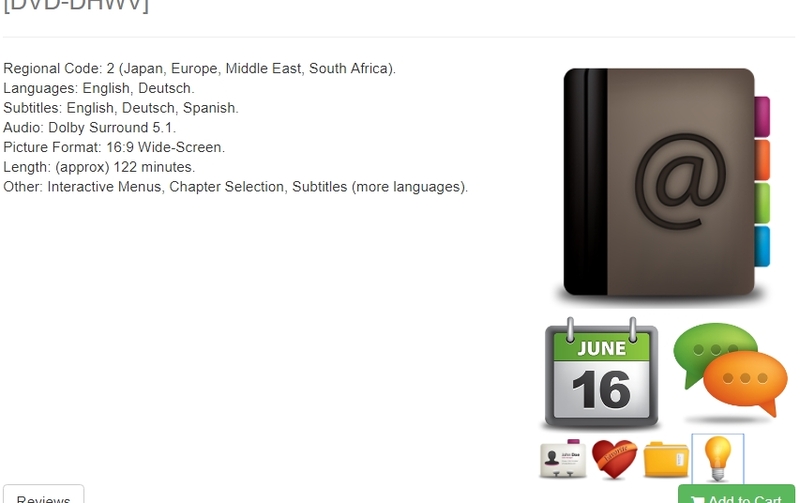 is in the language file, again easily changeable. and elsewhere (eg search results), but you get the idea. 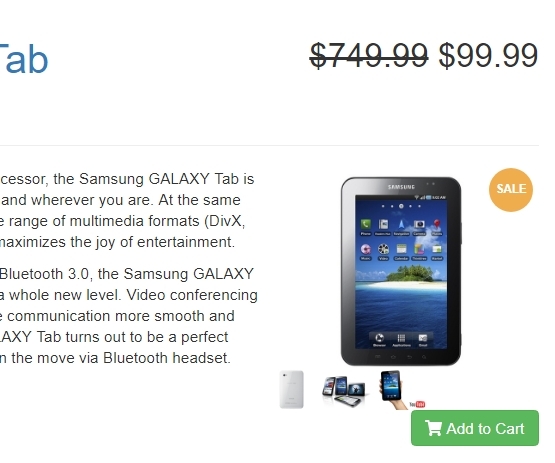 I've always found it a bit strange that osCommerce software never really made anything of a product on special offer. 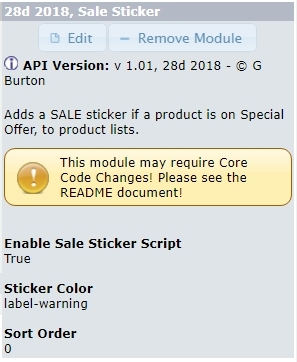 A decade ago I made a module that did this same thing (add in a sticker) differently, and even just last year an update of that to simplify it. Now this new module is the most simple of all, just a HT module to upload and turn on, assuming on up-to-date Edge! 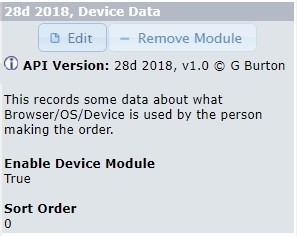 A way to *attempt* to see some data about the device that the Customer used to place the Order. Consists of 1 module and 1 hook, and a helper file. 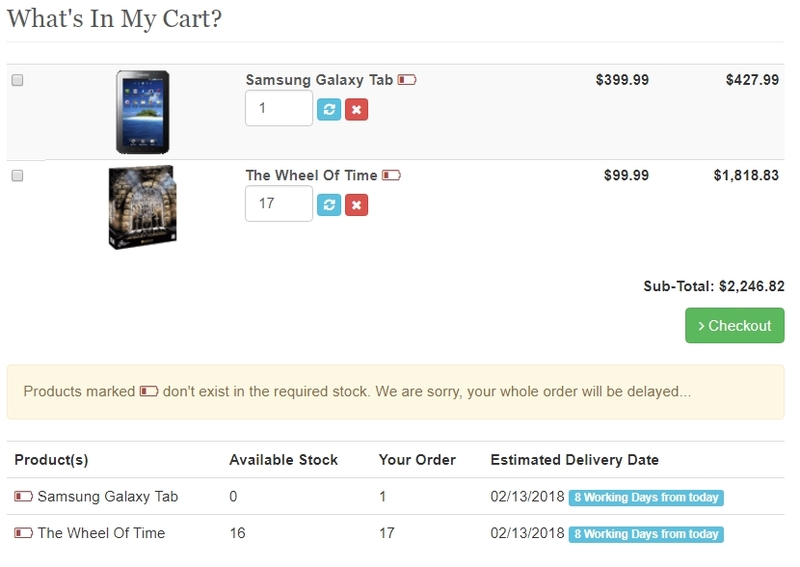 Standalone page and helpers for the Admin Side, which allows you to easily email customers to let them know they have a saved (abandoned) cart. Outgoing Email Contents can be changed in the Language File. What was the name of your first cat? What was your mothers maiden name? They do that to increase security, as only you know the answers you gave...and no-one else should. I have made such a thing for osCommerce. It takes 1 random question from your list of questions, it then sees if the answer given by the customer matches what they originally answered. If yes, happy days. If no, error out and refuse action. YES. 3 lines of code on each form you want to protect. Everything else...no core changes at all. 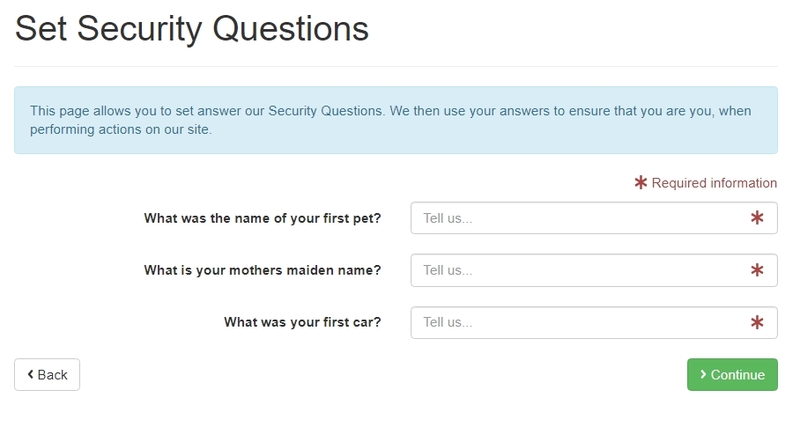 Shop Side (link in account.php to answer security questions) - "secure your account"
An easy way to give an extra layer of security to your customers. 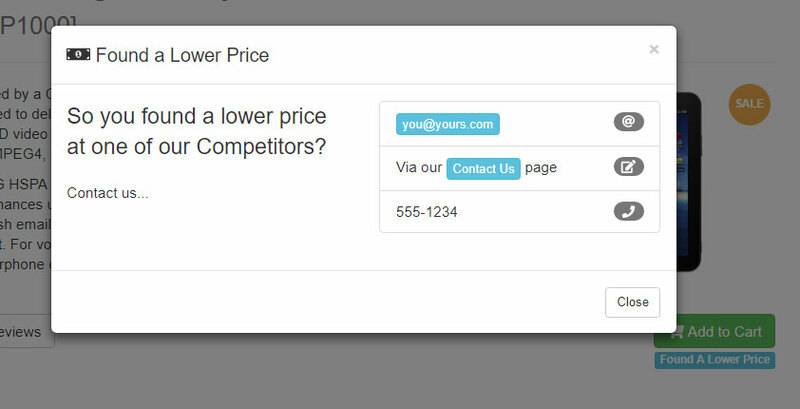 Into the final week with a module that allows your customers to find out how to contact you if they find a lower price. Notice here that you can change the "action" which can be click or hover. 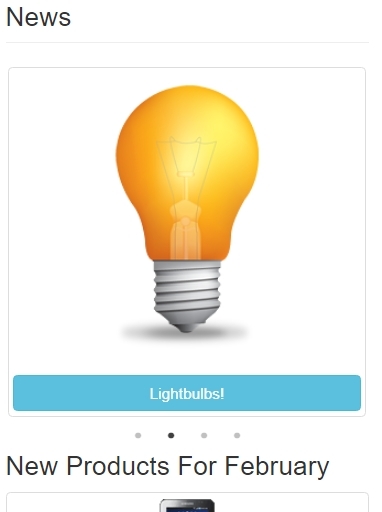 You can also attach the label anywhere on the page, with a bit of experimentation it can look really good. Obviously all of the ext etc in the popup is changeable by you in the language file. Quick and easy way to let customers know you are open to be told about lower prices. I have some more Tabbed goodness for you, these are used with the 28d02 set of modules. Set up X-selling on a per product basis. 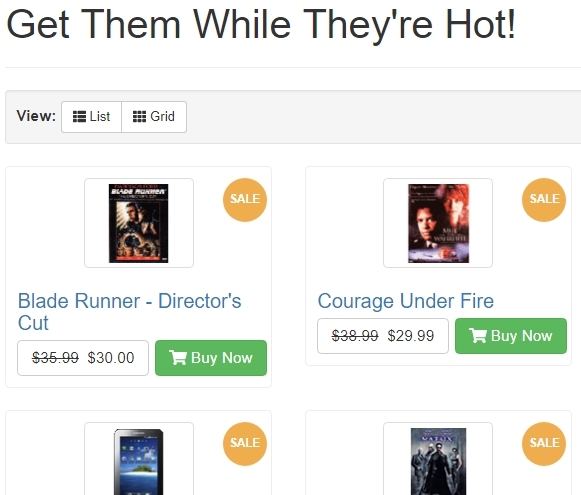 Show the X-Sells in a Tab! Note: Requires a previous X-Sell system of mine, included. Much better looking Social Share Icons shown in a Tab! Note: Requires a previous social modules of mine, included. Three useful additions to the Tabbed System! While coding up these modules, I did find a tiny bug in the main p_i module, this would not have shown itself with the original included modules. Bug Hotfix will also be sent tonight.